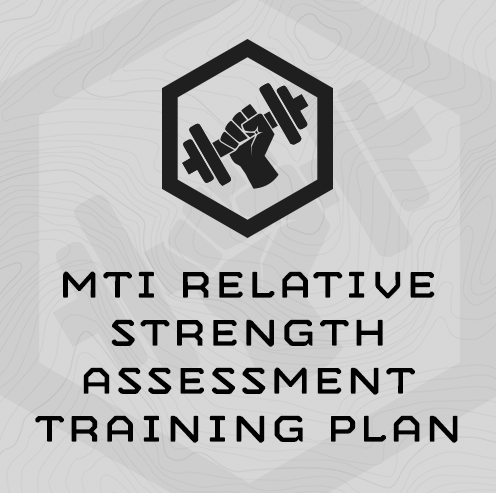 This plan is designed specifically to develop strength results from the MTI Relative Strength Assessment. It has a heavy strength focus, utilizing a density format 3x days a week. You will also train Work Capacity/Chassis Integrity and Endurance 1x a week each in this 5x/day, 5 week training program. The last week is a re-assessment and deload week. The plan focus is to increase your 1-Rep Max for the Front Squat, Power Clean, and Bench Press. You will also train to increase your max number of strict Pull Up’s. Record 1RM’s, max pull ups reps, and Bodyweight. Add together your finishing loads for front squat, power clean and bench press. For pulling strength, multiply your max rep pull up times 10% of your bodyweight. For example, if you weigh 200 pounds, and get 12 pull ups, you’d multiply 10% of 200 (200 x .1 = 20) and 12. 20×12 = 240. 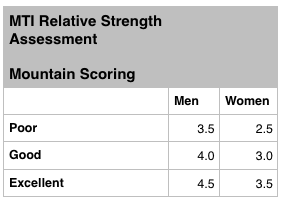 ** Note on Pull Ups … the Max Number you can use for scoring for this assessment is 20. So even if you tested at 25x pullups, the most you can use for your scoring is 20. 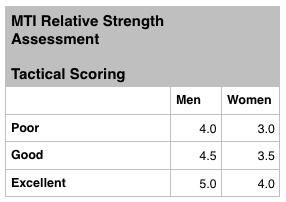 ** Note on Pull Ups … the Max Number you can use for scoring for this assessment is 20. So even if you tested at 25x pullups, the most you can use for your scoring is 20. Add your pulling strength total to your other 1RM’s, and divide by your bodyweight. The final number is your score. The Density Strength progression uses percentages based off your 1-Rep Max, with working rounds to be completed in a prescribed amount of time. If your 1-Rep Max for Power Clean is 200#, you will use 170# for all 5 Rounds (200 x 85% = 170). Set a running clock. Every 90 seconds, complete 4x reps of the exercise. Rest the remainder of that time. Repeat once the 90 seconds is up. The entire effort should take 7:30 min. Ideally, you will train Monday through Friday, and take Saturday and Sunday as full rest days. If for some reason you cannot keep this schedule, do not skip any sessions, do them exactly in order as they are designed. We’ve deployed TLU programming with Special Forces, professional mountain athletes, office workers and high school sports teams. It’s awesome strength programming! How Long should the strength sessions Take? 60-70 minutes. It will take a week or two to figure out the flow, and these sessions may extend to 70 minutes for the first couple weeks. But beginning week 3, you should have a good idea of the flow and move through them quicker. Aim to finish right around 60 minutes. Fully-equipped functional fitness gym including racks, barbells, bumper plate, dummbells/kettlebells, plyo boxes, slam balls and sandbag. Wanted to let you know I really enjoyed this program. It has been quite a while since I’ve spent this much time with barbell lifts. It was really rewarding to see the gains being made. Challenging program but well worth it. Below are my numbers.